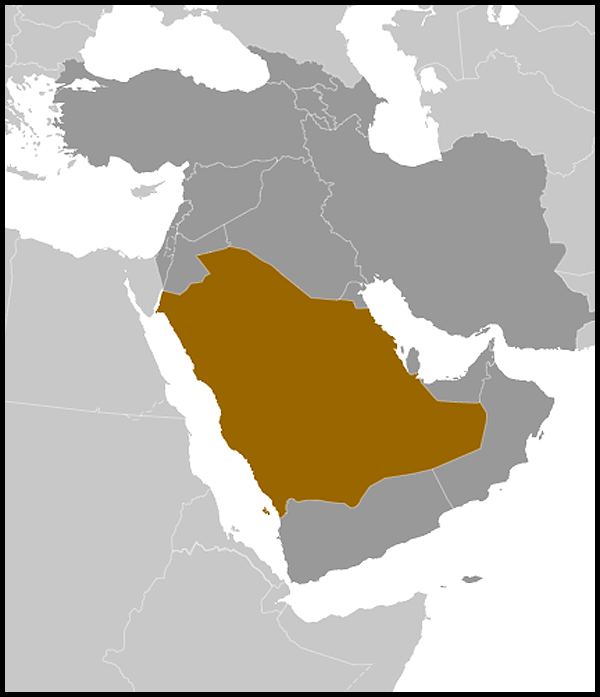 The Kingdom of Saudi Arabia is the largest Arab country of the Middle East. It is bordered by Jordan and Iraq on the north and northeast, Kuwait, Qatar, Bahrain and the United Arab Emirates on the east, Oman on the southeast, and Yemen on the south. The Arab Gulf lies to the northeast and the Red Sea to its west. 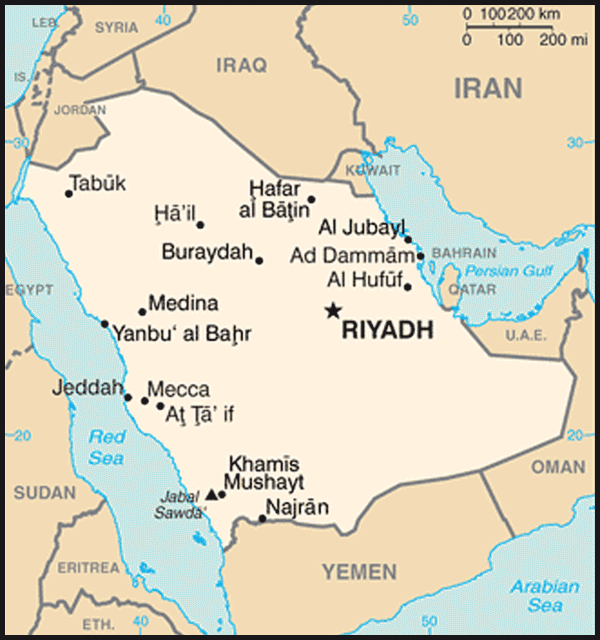 The origins of the Kingdom of Saudi Arabia go back as far as 1744 with the establishment of the first Saudi State. The formation of the current Kingdom began in 1902, when Abdul-Aziz bin Saud captured the Al-Saud's ancestral home of Riyadh, and culminated in 1932 with the proclamation and recognition of the Kingdom of Saudi Arabia. The Kingdom of Saudi Arabia is a traditional monarchy. King Abdullah succeeded to the throne on 1 August 2005, following the death of his brother, the late King Fahd. The King is assisted by a Council of Ministers which he appoints and which includes royal family members. In recent years the consultative Shura Council, which consists of 150 individuals appointed by the King, has developed a modest but increasing role in public debate. Municipal elections were held in 2005, but a second round scheduled for 2009 has been postponed until 2011. Saudi Arabia is a member of the Gulf Cooperation Council (GCC), which also includes the United Arab Emirates, Kuwait, Oman, Bahrain and Qatar. It is a member of the Arab League, the Organization of the Islamic Conference, the G20, the United Nations and the World Trade Organisation (WTO). With a population of over 27 million, 18.7 million Saudi and the rest expatriate, and over 20 per cent of the world's conventional oil reserves, Saudi Arabia is the Middle East's largest economy. Although efforts have been made to diversify the economy, it remains heavily dependent on the oil and petrochemical sector and will continue to be so for the foreseeable future: while the private, non-oil sector's contribution to GDP has increased over the past decade to about 45 per cent, oil and oil derivatives still account for nearly 90 per cent of Saudi export earnings and budget revenues, and about 55 per cent of GDP. The Kingdom's economy has weathered recent global economic turmoil better than most countries. Prior to the full effects of the crisis, it experienced non-oil growth of 4.3 per cent in 2008. Soaring oil revenues over recent years have created record budget and current account surpluses. The economy is forecast to grow by an average of 3.7 per cent a year in 2010-11, limited by only a modest pick-up in oil production. The growing economy has been matched by an increase in demand for imports, driven largely by massive construction projects. While Saudi Arabia has not emerged unscathed by the global financial crisis (growth in 2009 fell to 0.15 per cent from 4.3 per cent in 2008), it is expected that the government's stimulatory budgets in 2009 and 2010 will spur economic growth and investment. Ambitious plans for investment in the development of the petrochemicals, oil refining, phosphates and gas sectors could significantly increase the percentage of oil and oil derivatives. However, weak confidence and tight credit conditions will continue to constrain private sector growth. Under the leadership of then Crown Prince Abdullah, the Saudi Government initiated structural reform measures in the 1990s designed to encourage privatisation, liberalise foreign trade and reform investment regimes. Commercial laws were revised and initial steps were taken to free up foreign investment and privatise parts of the state sector. As King, Abdullah has continued this agenda and a focus on economic diversity and privatisation has been evident throughout his reign. In March 2007, the opening of new sectors to foreign investment including insurance services, wholesale/retail trade, communications services and air/train transport services was announced. In December 2005, Saudi Arabia acceded to the WTO. Australia and Saudi Arabia enjoy a friendly and cooperative relationship which has traditionally been based on extensive trade relations as well as people-to-people contacts. They also share a strong common interest in ensuring the security and development of the Gulf region. The most recent visit to Saudi Arabia by the Minister for Foreign Affairs, Stephen Smith, was in May 2009 and the former Minister for Trade, Simon Crean, visited in November 2008. A number of other Ministers have also visited Saudi Arabia in recent years. The most recent senior Saudi visitor to Australia was the Higher Education Minister Dr Khalid Al-Ankary in May 2010 (http://www.deewr.gov.au/Ministers/Gillard/Media/Releases/Pages/Article_100527_134138.aspx) , who signed a MoU on Higher Education Cooperation with Australia. The Council for Australian-Arab Relations (CAAR) is working to broaden and deepen relations with Arab countries, including Saudi Arabia. CAAR has sponsored visits to Australia by senior Saudis from government and business. As Australia's second largest market in the Middle East, Saudi Arabia is an important trading partner for Australia. In 2009, Australia's merchandise exports to Saudi Arabia totalled A$1724 million, making it our 17th largest market. Saudi Arabia was Australia's biggest market for exports of passenger motor vehicles worth A$811 million in 2009. Other major exports were barley, meat products excluding beef, and live animals. In 2009, Saudi Arabia was also Australia's third largest Middle Eastern market for live sheep, importing over 576,000 heads valued at A$55 million. On 4 May 2005, a Memorandum of Understanding on the Trade in Live Animals (MoU) was signed by the Australian Agriculture Minister together with his Saudi counterpart. The MoU outlined conditions for the trade and includes assurances that livestock (sheep, cattle, goats) will be treated in line with international animal welfare standards. On 21 March 2009, the Agriculture Minister Tony Burke and his Saudi counterpart signed a joint declaration amending the 2005 MoU to provide further detail on the livestock trade. Saudi Arabia is also a substantial market for dairy products, vehicle parts and accessories, as well as a growing market for fresh vegetables, refined metals and information communications technology products. Exports of services including tourism are increasingly important, with nearly 6,000 Saudis visiting Australia in 2009-10. In November 2009, Saudi citizens gained access to online tourist visa applications. This significantly improves visa processing times and improves access to visa services within the Kingdom. There is also scope for the expansion of financial services trade between the two countries. A large number of Saudi students are choosing to study in Australia, mostly under the King Abdullah Scholarship Program. In 2009, 12,500 Saudi students were enrolled in Australian educational institutions in a wide range of fields including health, IT, business and accounting. As at April 2010, over 9,000 were studying in Australia. There are over 3,000 Australian citizens employed in Saudi Arabia, mainly in health, education and other specialist areas. The Australian Government is committed to expanding Australia's strong and growing trade and investment relationship with the countries of the GCC, and to this end commenced negotiations for a Free Trade Agreement with the GCC (http://www.dfat.gov.au/fta/agccfta/index.html) as a whole in 2007. Four rounds of negotiations have been held, the most recent in June 2009. There is scope for Australia to develop the bilateral relationship with this key Gulf state further. Saudi Arabia has a sound economy with a fast-growing and young population, a well-managed banking system, good infrastructure, and generally low import duties and barriers. Its business community is sophisticated and is very familiar with Western practices. Saudi Arabia's needs are well suited to Australian capabilities. Australians enjoy a good reputation in the Kingdom for competence and tolerance. Reflecting the fact that Saudi Arabia is of particular interest to Australian business, Austrade (http://www.austrade.gov.au/) is represented in both Riyadh and Jeddah. For further information, please see " Business Guide to Saudi Arabia (http://www.dfat.gov.au/publications/business_saudi_arabia/) " and " Accessing Middle East Growth: Business Opportunities in the Arabian Peninsula and Iran (http://www.dfat.gov.au/publications/megrowth/index.html) ".